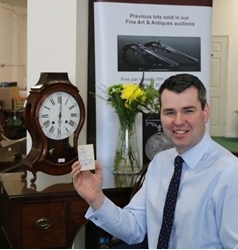 Leading Stowmarket auctioneer to put band card signed by The Beatles up for sale next month . Beatles Radio: The Beatles, Solos, Covers, Birthdays, News The Fab 4 and More! A Stowmarket auctioneer has announced it will be putting a very valuable piece of Beatles memorabilia up for sale next month. Bishop & Miller, one of the region’s leading independent auction and valuation firms, will welcome bids for a band card autographed by the legendary foursome, worth an estimated £1,000-£1,500. The sale will be the key highlight of Bishop & Miller’s first Toy and Memorabilia auction on March 10, which will also feature a number of other collectable items up for grabs. The 55-year-old band card belongs to Mike Nicholson, a retired carpenter/joiner from King’s Lynn, who bagged the autographs at a Great Yarmouth gig way back in 1963. Mr Nicholson, then a musician himself, luckily knew the stage manager at the concert who was able to meet the band backstage.